Zo was sick on the couch and I was off to the store to by her list of requested items. I decided I would make her a get well meal and thought, "Man it has been a while since I cooked her up a mignon." www.Cookingforzo.com really takes our meals on twists and turns. I try not to cook too much of one kind of a meal for two long, even if we do have our favorites! Heck, Zo and I could eat Mexican and Italian every day! So I thought it would be nice to jump back and cook something we had not had in a while. Also mignons are one of the first non-vegetarian meal I ever made for Zo back when we first got together 3 1/2 years ago! I hope you enjoy this tasty mignon with someone you love! Heat oil and butter over medium heat until butter is bubbly. Add onions and cook for 5 minutes, stirring every other minute. Add salt and pepper continuing to cook for 10-15 minutes stirring every other minute until caramelized and browning. Once caramelized and browned deglaze with red wine, add brown sugar and fresh crack pepper, turn heat down to low and simmer for 2-3 minutes. Remove from heat but keep warm until ready to use. Rub steaks with oil, pepper and salt. Sear steaks on both sides for 2 minutes and then lower heat to medium. Cook 4-5 minutes flip and continue to cook 4-5 minutes or until desired doneness. Remove from grill and let sit 5 minutes. 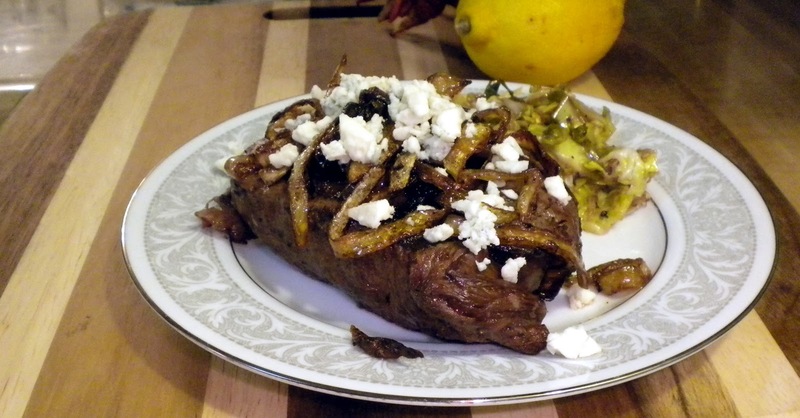 Spoon onions over steaks and then sprinkle with crumble blue cheese and enjoy!